Freshly Made Sketches: Winners For Sketch 263! Thanks so much to everyone who joined us in the gallery this week. There were such stunning takes on the sketch! Betty's gorgeous card really caught my eye. I was totally overwhelmed by those beautiful and delicate snowflakes. And the color palette is so classy. Congratulations, Betty, you are the Queen of Clean! Congrats to all! Thank you Cindy for picking my card...made my day! Have a wonderful Thanksgiving week! WOW - never expected to be your queen of clean - THANK YOU so much, Cecile - you made my week!! Congratulations to all the picks! Thank you, Jen B for picking my card! What a day brightener! Happy Thanksgiving! Betty- congratulations on being chosen as the Queen of Clean! 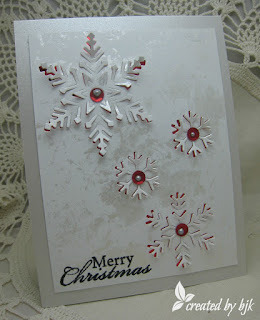 I love your snowflakes and use of the sketch! Thanks Narelle for choosing my card as your pick- what a wonderful surprise!! Hugs to all of you and Happy Thanksgiving!! Jen M., thanks so much for picking my card! I'm a bit late to the party here! Congrats to Betty and all the others for their amazing cards! I'm honoured to be in their company!